The technology group Wärtsilä has signed an agreement with the international shipping company Hagland Shipping AS for a hybrid retrofit installation. The project will take place onboard the ‘Hagland Captain', a general cargo vessel owned by Hagland Shipping. It will be the first project of its kind ever in short-sea shipping applications. The agreement was signed in December 2018. The installation of a Wärtsilä battery hybrid propulsion solution will significantly enhance the ship's environmental performance by reducing its emissions, fuel consumption, and noise. 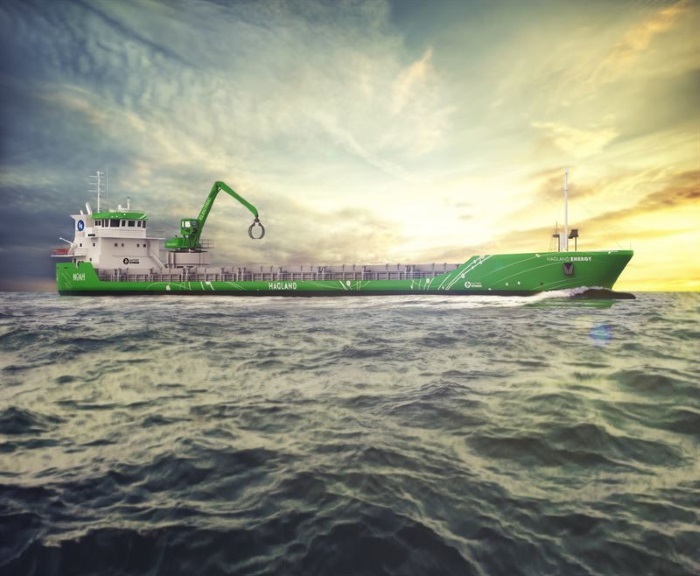 Included in the solution are a shore power connection to provide power for loading/unloading operations and for battery charging, a new reduction gear with power take-off (PTO) and power take-in (PTI) technology, and a Wärtsilä NOx Reducer (NOR). It is estimated that the total reduction in nitrogen oxide (NOx) emissions after the retrofit could be as much as 80 to 90 percent, while overall fuel cost savings are expected to be in the range of 5 to 10 percent. The battery capacity will be sufficient to sail in and out of harbour on electric power for approximately 30 minutes, which will effectively reduce noise and pollution levels in the vicinity of the harbour. An impression of how the ‘Hagland Captain' will look after the retrofit of a Wärtsilä hybrid propulsion solution. The conversion will create fuel savings and environmentally sustainable operations. Image copyright: Hagland Shipping AS. The project is in response to a collaborative agreement between Hagland Shipping and NOAH AS, the Norwegian environment and resource company, whereby the shipping of materials to the island of Langøya in Norway is required to be via environmentally sound vessels. Wärtsilä's solutions will play a crucial role in enabling the ‘Hagland Captain' to meet this requirement. Valuable input to the project concept has been given by the non-profit NGO, Bellona. Wärtsilä's hybrid solutions are based on a ‘first-of-its-kind' fully integrated hybrid power module. This combines engines, an energy storage system using batteries, and power electronics optimised to work together through a newly developed energy management system (EMS). It marks a new frontier in marine hybrid propulsion.